This article was initially written as part of the IEEE STARS program. The 1951 introduction of the large-scale UNIVAC computer from Remington Rand began a three-decade transition from over half a century of data processing on punched-card equipment to the widespread use of stored-program computers. While large firms profitably employed early large-scale computers, most businesses could not afford them. The transition to computers gained momentum in the mid-1950s with introduction of the magnetic-drum IBM 650 and the magnetic-disk IBM 305, and again in the 1960s with the magnetic-core and transistorized IBM 1401. With deliveries tripling every year, computer revenues exceeded those of punched-card equipment by 1962. Over the past six decades, the raw processing power of computers has increased by six orders of magnitude while cost has dropped by three orders of magnitude. Computers have become ubiquitous, invisibly embedded in everyday items such as mobile phones, cameras, automobiles and entertainment systems. By comparison, in the early 1950s, only the largest firms and institutions could afford a computer. Leasing for about $200,000 per month in inflation-adjusted 2010 dollars, a large-scale computer occupied roughly a hundred square meters, used thousands of vacuum tubes, consumed over a hundred kilowatts, and needed a full-time operating and maintenance staff. In order to broaden the market, vendors endeavored to offer computers to replace the punched-card equipment widely used by businesses and institutions for over half a century. In this essay, we highlight the most popular and widely used computers from the early-1950s through the 1960s. These computers, manufactured in substantial quantities relative to their time, spearheaded the transition from punched-card equipment to stored-program computing. Beginning with the invention of the tabulator, keypunch, and sorter in the late 1880s, punched-card equipment became progressively more versatile and widely employed in the automation of business tasks such as payroll, billing, inventory, and receivables. By 1950, vendors such as IBM, Remington Rand, and Bull offered a variety of punched-card machines: keypunches, accounting machines/tabulators (printers), sorters, collators, calculators, interpreters and reproducers. IBM’s card with rectangular holes, introduced in 1928, held up to 80 characters while Remington Rand’s card with circular holes, introduced two years later, held up to 90 characters. Punched-card equipment processed decks of cards, most machines tailored for a particular task by a removable plugboard control panel. By manually plugging patch cords, users “programmed” calculation or control steps and card movement from input card hoppers to output card stackers. Punched-card machines were electromechanical, using electrical circuits, relays and electromagnets for control and electric motors for moving punched cards and paper via pulleys, rollers, gears, levers, and blades. Small business firms in the 1950s automated their data processing tasks by leasing an assortment of punched-card machines for about $2,500 per month ($20,000 inflation adjusted). They consumed millions of punched cards per year, which often cost more than the equipment rental itself. First introduced in 1931, the electromechanical multiplying punch supplemented accounting machines and was also used for scientific and engineering calculations. In 1946, IBM announced its 603 Electronic Multiplier, the first vacuum-tube calculator; two years later, it introduced the more capable 604 Electronic Calculating Punch. Renting for $550 per month ($5,000 inflation adjusted), the 604 could multiply or divide about a dozen numbers per second. Not today’s hand held calculator, it had 1,400 vacuum tubes, weighed 630 kilograms and consumed 8,000 watts. In 1951, the US Census Bureau began using Remington Rand’s UNIVAC stored-program computer. It rented for $16,000 per month ($130,000 inflation adjusted), had a 1000-word memory with 12 characters per word, and offered magnetic tape drives and a 600 lines-per-minute printer. A total of 43 UNIVACs were ultimately delivered to businesses and institutions during the 1950s. In 1953, IBM delivered its 701 Electronic Data Processing Machine, a large-scale computer for scientific and engineering applications, including national defense calculations. Two years later, IBM introduced its 702 Data Processing System for businesses. Other US manufacturers of large-scale commercial computers during the 1950s included Burroughs, Datamatic, Engineering Research Associates (ERA), GE, NCR, RCA, and Philco. 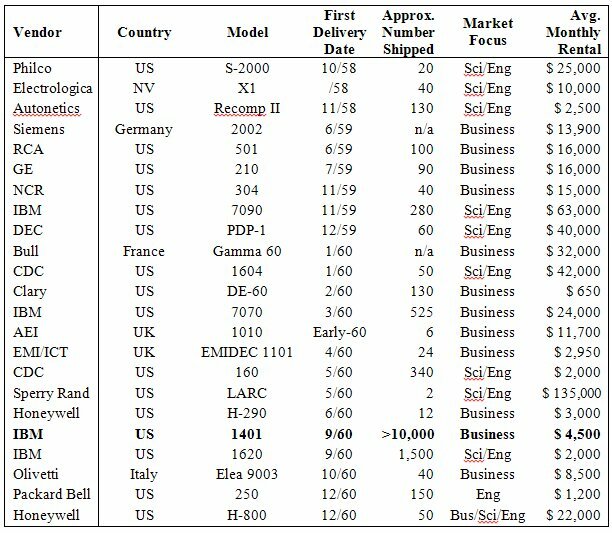 European manufacturers included Bull, Elliott, Electrologica, EMI, English Electric, Facit, Ferranti, ICT, Lyons, Olivetti, SEA, Siemens, and Zuse. By the close of the 1950s, a dozen US vendors had delivered approximately 450 large-scale computers, of which 350 were from IBM. Large firms found that, despite their high costs, large-scale computers could pay for themselves by consolidating accounting, clerical, and record keeping services across different departments. Also, by employing mathematical algorithms from the field of operations research, manufacturing firms could optimize their distribution of goods and materials. Companies and institutions proudly showcased computers in iconic glass-fronted rooms. Reinforcing the preeminence of large-scale computers, the industry consultant Herbert Grosch asserted that computational capability was proportional to the square of a computer’s cost: twice the cost should yield four times the capability. Nevertheless, despite “Grosch’s Law,” firms sought less costly computers that they could wholly control for faster programming development cycles and freedom from the interruptions of a shared service. By the mid-1950s, over a dozen intrepid vendors endeavored to deliver inexpensive vacuum-tube computers. Limited in their capabilities, none were shipped in quantities of more than a hundred or so. While IBM developed large-scale computers in its laboratory in Poughkeepsie, New York, engineers in its upstate Endicott laboratory designed a medium-scale computer based on a rotating magnetic drum for memory. Delivered in 1954, the IBM 650 Magnetic Drum Data Processing System targeted scientific, engineering and business applications [Figure 1]. Like the large-scale computers, it supported magnetic-tape drives and also offered a scientific floating-point arithmetic option. A usable entry configuration leased for $4,000 per month ($32,000 inflation adjusted). Using vacuum tubes for control circuits, the 650 offered 2,000 words (of ten digits or five alphanumeric characters each) on a 10-cm diameter drum spinning at 12,500 revolutions per minute. A few years later at IBM’s new laboratory in San Jose, California, engineers pioneered a computer based on the world’s first moving-head magnetic disk drive. 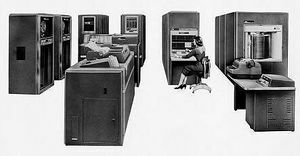 Delivered in 1956, the IBM 305 RAMAC (Random Access Method of Accounting and Control) targeted business applications such as inventory, billing, accounts receivable, and transaction processing. The entry configuration leased for an attractive $3,200 per month ($25,000 inflation adjusted). The 305 used vacuum tubes and a plugboard control panel and could execute up to 200 instructions from a small magnetic drum memory. The RAMAC stored up to 5,000,000 characters on a stack of fifty 61-cm diameter disks spinning at 1,200 revolutions per minute. By 1956, a computer census reported that three-quarter of the world’s 1,100 computer installations were IBM 650s, making it by far the most popular computer at the time. Its numbers later peaked at 1,800 installations. The IBM 305 RAMAC was nearly as successful, with over 1,000 delivered before its withdrawal in 1961. Although the IBM 650 and 305 cost less than one fifth that of a large-scale computer, many small businesses still found them too expensive, with a monthly rental exceeding that of their typical assortment of punched-card machines. During this time, computer designs normally targeted either scientific or business applications, but not both. In general, scientific and engineering applications benefited from the fastest possible arithmetic calculations, whereas data processing applications did not benefit from processing speeds faster than the input/output data rates of peripheral devices. A design focused on business data processing applications, together with less expensive circuits, was required before the economical needs of the small-business punched-card marketplace could be met. This suggested a cost target close to the $2,500 monthly rental for a small business’s typical assortment of punched-card equipment. Early computers used ingenious but challenging memory technologies. Acoustic delay lines in the UNIVAC and rotating magnetic drums in ERA and IBM computers yielded slow and non-uniform access times relative to the speed of vacuum-tube circuits. The random-access electrostatic cathode-ray-tube memories used in the IBM 701 and 702 were fast enough but not sufficiently reliable. In the early 1950s, MIT’s Jay Forrester, working on the government-funded Whirlwind computer project, pioneered a new type of memory that used arrays of tiny doughnut-shaped magnetic cores threaded by control wires [Figure 2]. Clockwise or counterclockwise magnetization of a core represented a binary 0 or 1. 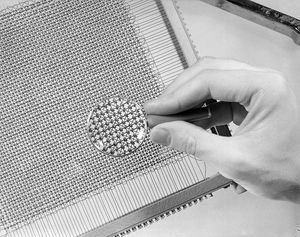 By late 1952, Forrester had demonstrated a 16×16 core-memory array and IBM independently prototyped an 80×12 core array that could buffer data from a punched card. Figure 2: 64×64 magnetic-core memory plane hand fabricated for MIT’s mid-1950s Whirlwind computer. Picture used with the permission of The MITRE Corporation. Copyright © The MITRE Corporation. All Rights Reserved. In late 1952, IBM contracted with MIT for a new large-scale computer for SAGE, an enormous real-time surveillance and control system to defend US airspace against the threat of Soviet Union bombers. Delivered in 1955, the first SAGE computer used a large memory stack comprised of thirty-six 64×64 magnetic-core arrays. Up until this time, magnetic-core arrays were predominately hand assembled by women who deftly threaded hypodermic needles through selected cores, requiring forty hours per array. Because the SAGE installations would need tens of millions of cores, IBM built a core threading machine and a facility that could fabricate and test half a million cores per day. 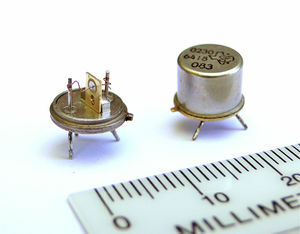 Figure 3: Alloy-junction germanium transistor manufactured at Texas Instruments in the mid-1960s using an automated assembly line designed by IBM in the late 1950s. In 1947, researchers at Bell Labs invented the transistor, based on the semiconductor germanium. Several years later, they introduced a more reliable and easier-to-manufacture alloy-junction transistor. Initially more expensive, less reliable and slower than vacuum tubes, transistors were nevertheless predicted to become a hundred times cheaper, more reliable, and faster. By the mid-1950s, universities and research institutions had prototyped experimental transistorized computers. In 1954, IBM demonstrated a fully transistorized adaptation of their 604 calculator which, in place of 1,400 vacuum tubes, used 2,200 alloy-junction transistors, magnetic-core memory, and 95% less power in half the space. In late 1957, IBM’s CEO Thomas J. Watson, Jr. banned the use of vacuum tubes in machine developments, expediting their conversion to transistors. At year’s end, IBM announced its 608 Electronic Calculator, the first commercial transistorized calculator. In 1956, in anticipation of mass-produced transistorized computers, IBM chartered a small team in Poughkeepsie to automate the assembly of transistors. By 1959, a fully automated production line was operational and capable of yielding hundreds of alloy-junction transistors per hour [Figure 3]. However, to the dismay of its creators, IBM decided not to manufacture transistors and transferred its automated production facility to Texas Instruments to supply IBM and others. During this time, IBM also developed its Standard Modular System (SMS) for the packaging of discrete solid-state transistors and circuit components, a more compact successor to its vacuum-tube modules. SMS printed-circuit cards implemented basic computer circuits, such as logic gates and single bit latches [Figure 4]. In 1959, IBM began mass producing SMS cards and wire-wrapped backplanes for its large-scale 7090 and for the Stretch supercomputer. With magnetic-core memory and transistors in widespread production, the 1960s witnessed a dramatic increase in the number of computers, with deliveries tripling every year. Table 1 lists the 23 earliest commercial computers delivered with magnetic-core memory and transistor circuits through the end of 1960. Philco was one of the first out in 1958 with its all solid-state, large-scale, scientific S-2000 Transistorized Automatic Computer. Using its innovative high-speed surface-barrier transistor, it competed with IBM’s later large-scale scientific 7090 Data Processing System. The Electrologica company in the Netherlands also delivered its medium-scale, solid-state, scientific X1 computer that same year. 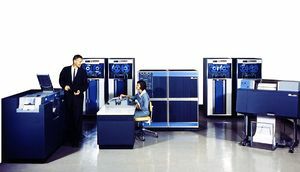 Although the IBM 1401 Data Processing System was not the earliest solid-state commercial computer, it rapidly became the world’s most widely used and held that distinction through most of the 1960s [Figure 5]. 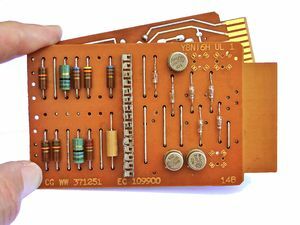 The story behind the 1401’s success is explained in part because it targeted the small-business punched-card user marketplace while leveraging IBM’s mass-production capabilities and worldwide customer support organization, as described next in a case study of its product development. Table 1: Earliest commercial solid-state computers delivered through end of 1960. List is ordered by first delivery date to an external customer. Compiled by the author from Computer Characteristics Quarterly and Computers and Automation. The 1401’s story begins in the early 1950s in France where Compagnie des Machines Bull out competed IBM with its punched-card machine that integrated a calculator and an accounting machine. In response, IBM convened a marketing study followed by parallel development efforts in its Paris, Böblingen, and Poughkeepsie laboratories. In 1955, the Paris laboratory’s design for a World-Wide Accounting Machine was selected for the processing unit along with new printer and punched-card peripherals from the Böblingen laboratory. By 1957, a prototype was up and running, but its entry-level configuration exceeded the cost target and it used a plugboard control panel. Turning to its Endicott laboratory, IBM appointed a young machine inventor and advocate of stored-program computing, Francis O. Underwood, for another attempt at formulating a low-cost data processing computer. He determined that the Paris design was well suited for character-oriented business data processing applications with its serial-by-character data paths and variable-length strings and decimal numbers. However, its plugboard control panel was unsatisfactory because its transistorized interface was too expensive. Also the machine’s total cost of ownership would be higher as users typically stockpiled multiple panels, pre-wired for different tasks. So Underwood excised its control panel and designed an easy-to-use instruction set format to control its data paths. He named the new computer SPACE, for Stored-Program Accounting and Calculating Equipment, striking a galvanizing chord after Sputnik’s startling appearance in space in October 1957. At the same, IBM had begun an engineering development in its Endicott laboratory under Jonas Dayger to address its uncompetitive printer speeds. By 1958, its engineering team had prototyped a novel printer using a rotating chain with character types that moved horizontally along a printed line, rather than moving perpendicularly to the line as in existing drum or bar printers. Its printouts were more pleasing to the eye because random horizontal variations in character positions are less noticeable than vertical displacements. On October 5, 1959, IBM announced the 1401 via closed-circuit TV to a world-wide audience of 50,000 in 102 cities. It was a runaway success. Over 3,000 orders poured in, outstripping its lifetime sales forecast in the first month and challenging the 5,000 computers in place worldwide. A year later, Time-Life Corporation in Chicago received the first production system. Figure 6. Estimated quantity of commercial computers delivered from 1959 until 1968. In mid-1965, nearly one out of every two computers was an IBM 1400 family computer. Compiled by the author from Computers and Automation. With the 1401’s rapid marketplace success, IBM followed up with 1401-compatible systems: the more capable 1410, the smaller 1440, the faster 1460, and the large-scale 7010. According to industry census reports, 1400 family computers numbered nearly half of the estimated 26,000 computers worldwide by 1965 [Figure 6]. 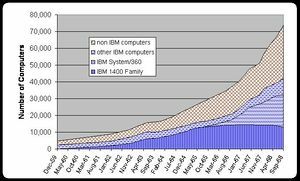 Two years later, installations peaked at 14,600 systems out of an estimated 50,000 computers worldwide. The 1401’s entry-level configuration initially leased for $2,500 a month, achieving the target rental cost of a small business’s typical assortment of punched-card equipment. Over several years, customer demand for higher memory capacities and peripherals – magnetic-tape drives, magnetic-disk drives, optical and magnetic bank check readers – raised the average monthly rental to $6,500 ($50,000 inflation adjusted). The 1401’s memory configurations ranged from 1,400 to 16,000 characters and its processing unit supported character strings and decimal numbers of variable length. Its serial-by-character processor clock ran at 87,000 cycles per second, compatible with its peripheral input/output character rates. The 1401 main frame used 10,800 transistors and consumed 4,000 watts. A full system, counting magnetic cores, comprised approximately half a million discrete components. Nevertheless, 1401s were robust and reliable, supported around the clock by on-call IBM customer engineers. Many 1401 systems operated seven days a week and seldom broke down. The introduction of the IBM 1401 abruptly transformed thousands of plugboard “programmers” into stored-program computer programmers. IBM offered an Autocoder assembler and COBOL, FORTRAN, and Report Program Generator (RPG) compilers. An IBM users group founded in 1955, SHARE, distributed hundreds of business, science, engineering, and mathematics applications free-of-charge. Although IBM did not supply an operating system for the 1401, it did so for the 1410 and 7010. IBM’s designers tailored the 1401 for existing punched-card equipment users, including an easy-to-use instruction format. Its entry-level configuration offered a rental comparable to a small firm’s typical assortment of punched-card machines. Its 1403 chain printer produced the industry’s highest quality output. The 1401’s processing speed was balanced with peripheral data transfer rates and its serial character-oriented architecture readily supported new peripherals. IBM’s circuit designers used established and robust components, resulting in high field reliability, even when powered from low-quality electrical grids. IBM mass produced its own standardized and interchangeable printed-circuit boards in high volumes for a broad line-up of transistorized computers. IBM owned, leased and maintained its products employing a worldwide customer engineering support and service organization. Because of its ease of use, robustness, and popularity, the 1401 acquired a sort of mystique and lore. Computer historian Paul Ceruzzi noted that “users had an irrational affection” for 1401s. There were even programs that could whimsically render melodies on the chain printer or induce ethereal-sounding music from an AM radio. In late 1963, just four months before IBM was to announce its System/360 computer family, Honeywell introduced its H-200 computer with ‘Liberator’ software that could run 1401 programs faster than a 1401. The unexpected appearance of the H-200 caught IBM off guard, instigating last minute changes to its System/360 Model 30 in order to efficiently run 1401 software and thereby defend against Honeywell’s shrewd foray. Development of the 1400 family terminated with the IBM System/360 announcement in April 1964. However, not until late 1968 did the new system’s lower-cost Models 20 and 30 overtake the 1400 family as the world’s most popular computers. IBM withdrew the 1401 in 1971, twelve years after introduction. At the time of the 1401 announcement in late 1959, firms around the world were employing over 300,000 punched-card machines. With the rapid adoption of transistorized and magnetic-core stored-program computers during the 1960s, demand for punched-card equipment began to plateau, and dropped for accounting machines and calculators in particular. Magnetic tapes played a key role in the decline of punched-card equipment. Since a single tape reel could hold the equivalent of tens of thousands of punched cards, peripheral data storage consumed much less physical space. For example, Time-Life Corporation transferred magazine subscriber records from 40 million punched cards to just hundreds of magnetic tapes. Software applications were available to sort and merge data using magnetic-tape drives instead of using sorters and collators. To a degree unforeseen by the 1401 product planners, about half of the 1400 family customers ultimately chose magnetic-tape-oriented systems. Because most computers during the 1960s still used punched cards for inputting software and data, keypunch machines endured through the 1970s. Furthermore, punched-card systems continued to be offered. In 1963, Sperry Rand introduced its UNIVAC 1004, a plugboard-controlled data processing machine with a monthly rental of $1,900. At 3,400 installations, it was the second most popular system to the 1401 before the System/360. Also significant, in 1969, IBM announced its System/3, a low-end business computer which used a smaller 96-character punched card and rented for just $1,000 per month. By 1974, IBM had leased over 25,000 System/3’s, compared to over 150,000 computers delivered by 50 vendors worldwide. In summary, the development of transistors and magnetic-core memories, along with the adoption of magnetic tape and disk drives, made stored-program computers more affordable and thus more widely used for business data processing. By 1962, computer revenues had overtaken those of punched-card equipment. With the 1970s introduction of electronic input and output terminals, the floppy disk for data interchange, and bar code tags for manufactured goods, the century-long era of punched-card data processing came to an end and the new era of stored-program computing was firmly established. The author is grateful to Emerson W. Pugh for providing editorial and technical guidance during the development of this article and to Richard Weaver, Jack Palmer, Paul Ceruzzi, Michael Williams, Ronald Mak, Dag Spicer, Charles Branscomb, and Mitchell Marcus for their generous and helpful feedback. And he would like to thank Paul Lasewicz for access to and reproduction of period IBM photographs. Any mistakes and omissions are solely attributable to the author. Robert Garner’s Silicon Valley career spans 33 years of management and engineering at Xerox Systems Development Division (STAR workstation) and Palo Alto Research Center (PARC), Sun Microsystems (SPARC architecture, microprocessors, and Sun-4 workstation), Brocade Communications, and IBM Research. In 2004, he volunteered at the Computer History Museum to lead the restoration of an IBM 1401; and in 2009, he organized the “50th Anniversary of the Legendary IBM 1401” event at the Computer History Museum. This page was last edited on 9 January 2015, at 17:16.